The laser at work. It takes 15 minutes to weld the five meter seam. According Headland Machinery , the railroad engineering company discovered laser welding for itself early on. It's a good thing that Jörg Weisshaar had already set the course for his company. Since then his company has been picking up more and more speed. Jörg Weisshaar points with satisfaction to an A pillar: "Doesn't that look like the steep curve segment of an oversized Carrera train?" It is his company's most recent product for railcar construction-a supporting vehicle pillar for double-decker trains for the commuter railway system. As a safety component in the forward area, it joins the roof to the undercarriage of the train. The double bent part, made of 3mm thick sheet metal, is a good 3.2 meters long and about 60cm wide. Robert Hebler, who is responsible for operating the TRUMPF LASERCELL, follows the laser weld seam with his finger. "We weld the A pillar seam, which is more than five meters long, using the automated laser machine and it only takes 10 minutes! Manually, it would take a highly skilled worker about two hours to do it. But we would neither be able to achieve the comparably high consistent quality nor the required dimensional accuracy." Only KWM Weisshaar is currently able to make that happen. The job shop, which over the last 25 years has grown from a three-man operation into a laser welding company with 400 workers, considers railcar construction one of its specialties. This is one industry that has recognised the benefits of laser welding when it comes to manufacturing components subject to quality inspections. For many tasks, there is no alternative to it anyway. Laser technology is a tradition at KWM Weisshaar. This began in 1992. Evan at that time, its work revolved around railway locomotives. By investing in one of TRUMPF's first LASERCELL TLC 105s, the company entered the world of 3D laser cutting. Soon, additional welding tasks were added. Peter Wendel, IT and Technology Manager at KWM, believes one reason for the success of laser welding is time saved. Compared to traditional processes, the laser is substantially faster. In addition, it has the invaluable advantage that it can join components almost without distortion, he says, emphasizing the quality aspect. Welding expert Klaus Petermichl is of the same opinion. He brought along a sample component that he puts on the table. The laser weld seam is extraordinarily even and smooth. So much so that it doesn't require any additional cleaning. Furthermore, levelling work is unnecessary. In addition to less time and better quality, cost effectiveness is also in demand. On the one hand, laser welding satisfies this demand in the refinishing work is also no longer necessary. This lowers the total cost in the process chain. On the other hand, a high utilization is necessary. With that in mind Jörg Weisshaar had a TRUMPF LASERCELL 1005 with a changer table installed in 2000. This enabled him to kill two birds with one stone: He can produce almost continuously. 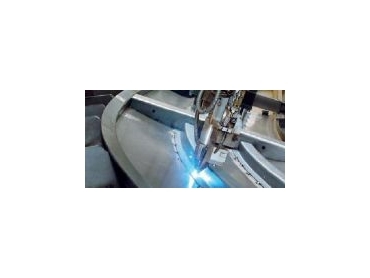 At the same time, a considerably more powerful laser machine is at his disposal-one that is able to weld parts with a greater penetration depth. One requirement for high laser weld quality is clamping devices that are perfectly adapted to respective part. "At the same time, cost-effectiveness is a consideration says Jörg Weisshaar. "Our design and development division has to be able to quickly design and manufacture both functional and inexpensive clamping devices for each order, particularly in view of small quantities that we, as a job shop, normally produce." Stefan Damback holds a sample part in his hands. He is responsible for project management in the print industry. The laser-welded cover that he brought with him was clamped onto a rotating quadruple clamping device. He turns the cover over so that all weld seams can be seen: "Laser welding relies on minimal and exact joining gaps. We have met this challenge. But to do so, ten parts had to be clamped." The quadruple clamping device is very complex to build. But it improves the relationship between the productive time and loading and unloading. The design engineers for the components would also be able to contribute to its design if they were to shape the metal sheets to be suitable for laser welding, perhaps using stops or mortise-tenon joints. Then the parts could be inserted easier and faster without gaps. Both TRUMPF LASERCELL machines have long been operating in two shifts at full capacity. At the same time, welding orders have exceeded cutting orders by about 60 percent. And the demand is continuing to rise. Thus, laser welding is an important division of the family business.